Lifting off from Baikonur Cosmodrome in Kazakhstan, a Russian Proton-M rocket soared into the sky to orbit a military communications satellite called Blagovest-13L. The launch occurred at 7:20 p.m. EST Dec. 20 (5:20 a.m. local time / 00:20 GMT Dec. 21), 2018. 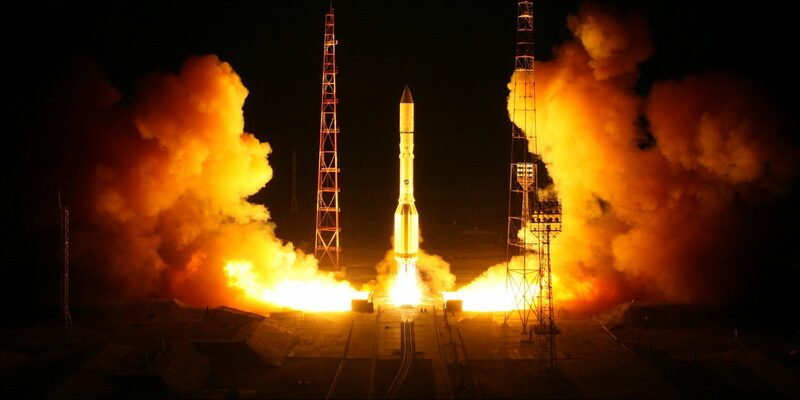 It was the second and final flight of a Proton rocket in 2018. Proton-M is a three-stage, 191-foot (58-meter) tall launch vehicle that can sport an optional Briz-M upper stage, as was the case for this flight. According to the Russian Defense Ministry and Tass, Briz-M and the satellite were successfully deployed into a parking orbit about 10 minutes after liftoff. Over the next several hours, it is expected that the upper stage will place Blagovest-13L into its designated geostationary orbit. Taking about nine hours, according to NASASpaceflight, Briz-M is expected to perform three additional burns to raise the spacecraft into a geosynchronous transfer orbit. A fourth and final burn should then raise the low point of its orbit and decrease its inclination relative to the equator (Baikonur Cosmodrome’s latitude is about 46 degrees North). Should all go according to plan, the satellite is expected to separate from Briz-M shortly after the upper stage’s final burn is completed. Blagovest-13L is designed to provide military communications for the Russian Defense Ministry, Tass reported last month. Developed at ISS Reshetnev, the satellites in the series are based on the Ekspress-2000 platform and have a design lifespan of about 15 years. Its communications payload includes Q-band and Ka-band antennas provided by Thales Alenia Space. Spaceflight Insider reported the launch of Blagovest-12L (the second satellite in the series) on a Proton-M rocket in April 2018. After launch, it was deployed in a geostationary orbit some 22,400 miles (36,000 kilometers) above Earth’s surface. Blagovest-11L (the first in the series) was orbited in August 2017. The Blagovest-13L mission was the 418th launch of the Proton rocket. The Russian military is expected to continue to expand its fleet of communications satellites in 2019 with Blagovest-14L expected to be the fourth satellite in this series.